Do you find it tough to look slim even in black jeans? Do you want to get rid of the extra flab because you care about your health? Then, the best way to lose weight without the hassle of counting calories or lifting weights is to include fiber-rich foods in your diet (1). Fiber is essentially a type of carbohydrate (and we thought carbs were bad!) that cannot be digested by humans. It helps in bulking up the stools and increasing the digestion and absorption time in the large intestine. It helps to improve the metabolic rate, cleanses the bowels, and increases satiety. We have handpicked 31 best fiber-rich foods and prepared a diet chart that will help you slim down and improve your health. Let’s begin. Other Vital Nutrients: Polyunsaturated fat, Monounsaturated fat, Vitamin E, Vitamin B-6, Vitamin K, Vitamin D, Vitamin A, Magnesium, and Iron. 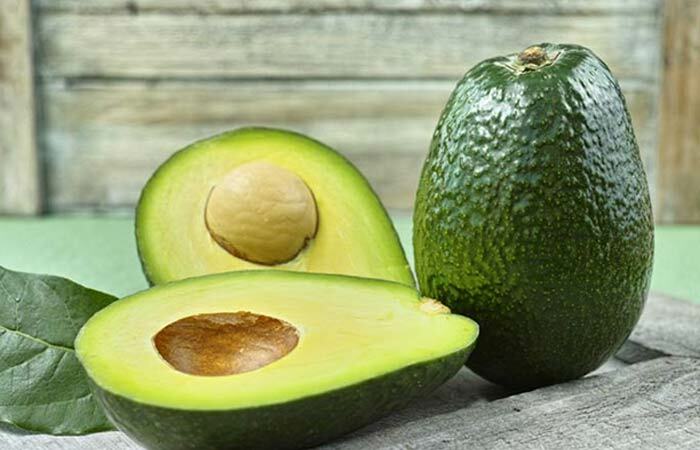 Green avocados are mostly from Florida and are high in soluble fiber as compared to the California dark-skinned variety. They are also rich in healthy fats that help reduce inflammation. This is why the avocado should be your go-to fruit. You can have it for breakfast with eggs or in a salad for lunch or dinner. Other Vital Nutrients: Vitamin K, Vitamin C, Vitamin A, Folate, Potassium, Calcium, Magnesium, and Phosphorus. The total fiber present in raspberries is 8.40 g per cup. They are also a rich source of vitamins C, A, K, and folate. Raspberries improve bowel movement and prevent bloating. You can have a raspberry smoothie for breakfast or toss a few raspberries in your oatmeal to give it a different flavor. Other Vital Nutrients: Vitamin C, Vitamin A, Vitamin K, Calcium, Magnesium, Phosphorus, Potassium, Zinc, and Iron. This sweet and granular textured fruit is one of the best sources of dietary fiber. It contains 24.30 grams of fiber per cup and is rich in other nutrients such as vitamins A and K, folate, and protein. 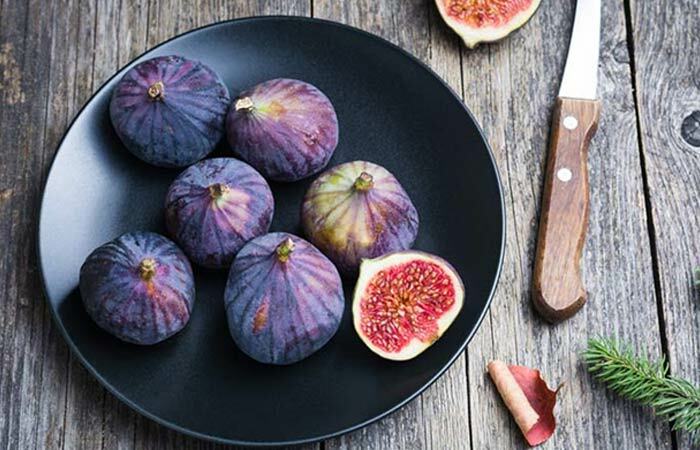 You can have figs for dessert or add them to your lunch salad. Other Vital Nutrients: Vitamin A, Vitamin K, Potassium, Calcium, Phosphorus, Calcium, and Magnesium. A cup of prunes contains 6.50 grams of soluble fiber and 5.60 grams of insoluble fiber. Prune juice helps treat constipation, and due to its high soluble fiber content, it is also a good weight loss agent. You can have prune juice for breakfast with oatmeal or add prunes to your grilled duck for dinner. Or make your dessert extra special by adding a few dried prunes to your low-fat yogurt. Other Vital Nutrients: Vitamin A, Vitamin C, Phosphorus, Calcium, Magnesium, and Potassium. This sweet tropical fruit is a great source of fiber. A cup of guava contains about 9 grams of fiber and is also loaded with vitamins C and A, magnesium, calcium, potassium, and many phytonutrients. 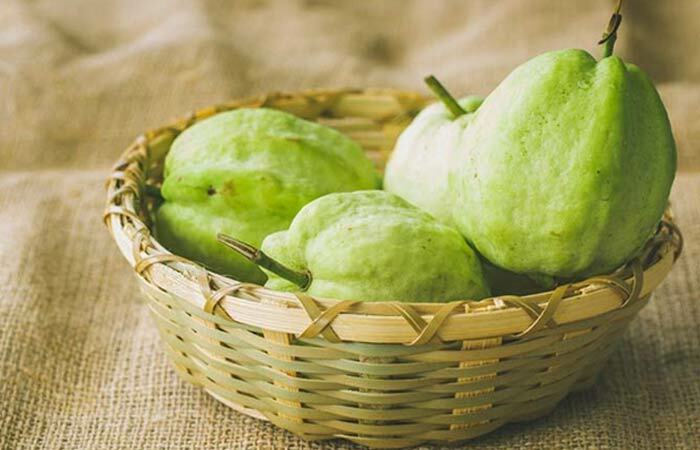 You can have guava as an evening snack or make guava juice for breakfast. Other Vital Nutrients: Vitamin A, Vitamin C. Vitamin K, Phosphorus, Potassium, Calcium, and Magnesium. This aromatic fruit is a wonderful source of soluble and insoluble fibers. Dried peach contains about 13 grams of total dietary fiber. It is also a rich source of vitamins A, C, and K, magnesium, potassium, phosphorus, and calcium. You can add dried peaches to your breakfast oats, smoothies or roasted turkey or chicken. Other Vital Nutrients: Vitamin A, Vitamin C, Folate, Magnesium, Phosphorus, Potassium, and Calcium. Gooseberries are also a good source of fiber. 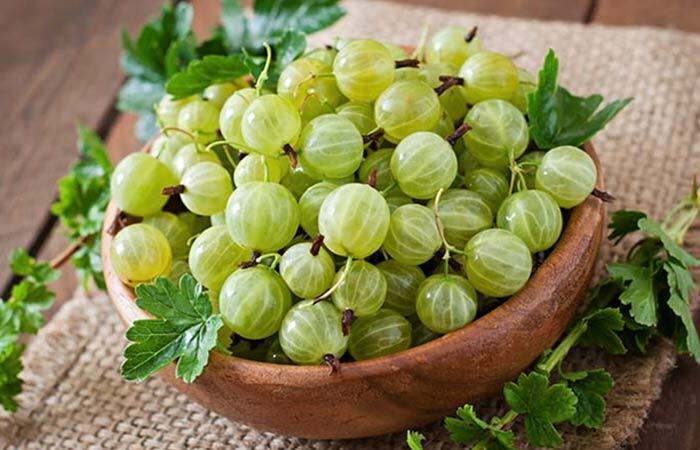 A cup of gooseberry contains 6.50 grams of fiber. They are also rich in vitamin C and phytochemicals that help maintain optimum health. You can have 2-3 sun-dried gooseberries right after lunch to help suppress your hunger pangs. You can also make sweet gooseberry marmalade and add it to your dessert or simply have a spoonful of it to curb your sweet cravings. Other Vital Nutrients: Vitamin A, Vitamin C, Folate, Magnesium, Phosphorus, Potassium, Calcium, and Monounsaturated Fats. This sweet and granular tropical fruit is rich in soluble and insoluble fiber. One medium sapodilla contains about 5 grams of soluble fiber and 9 grams of insoluble fiber. It is also a great source of calcium, potassium, and folate. You can add sapodilla to your breakfast smoothies or juices or have it for dessert with a cup of low-fat frozen yogurt. Other Vital Nutrients: Monounsaturated Fats, Polyunsaturated Fats, Vitamin C, Folate, Choline, Magnesium, Phosphorus, Potassium, Calcium, and Iron. Coconut is not a nut; it is a fibrous one-seeded drupe. The liquid endosperm inside the coconut is rich in vitamins and minerals. It is a natural electrolyte and is great for rehydration, weight loss, and better skin. 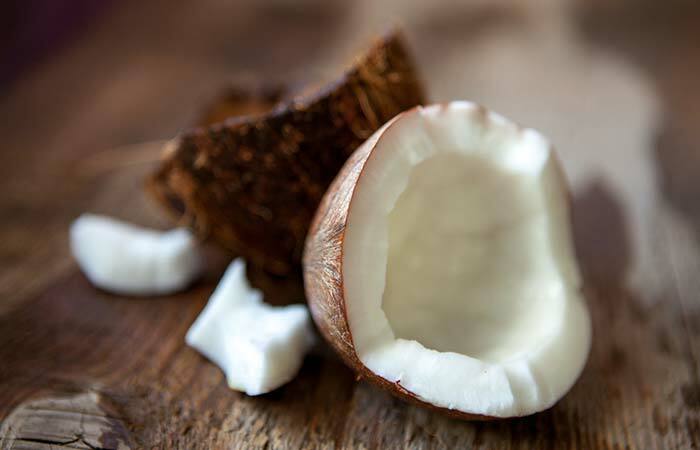 As the coconut ripens, the endosperm transforms into edible flesh, which is rich in vitamin E and dietary fiber. You can add grated coconut flesh to your breakfast bowl, casserole, or salad or just eat the coconut alone. It’s sweet, crunchy, and satisfying. Other Vital Nutrients: Vitamin A, Vitamin C, Vitamin K, Folate, Choline, Magnesium, Phosphorus, Potassium, and Calcium. This sweet, granular, fiber-rich, and cholesterol-free fruit is tasty and easily available. You can have it as it is or get a little creative and add it to your dessert, stew, grills, or salad. Other Vital Nutrients: Vitamin A, Vitamin C, Vitamin K, Folate, Magnesium, Phosphorus, Potassium, and Calcium. 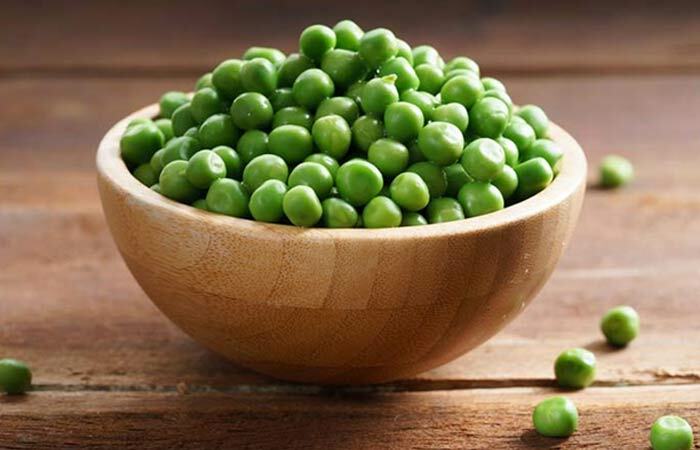 A cup of green peas contains about 9 grams of fiber. It is also an excellent source of vitamins A and C, calcium, phosphorus, potassium, and magnesium. You can add green peas to stir-fried veggies, quinoa, or chicken or mushroom stew. Yams are rich in dietary fiber, vitamins, and minerals. You can make grilled yam salad with green peas, chili, and herbs. You can also use air fry yams and have them with chili flakes, a little salt, and low-fat mayonnaise. Add them to curries or casserole and have with brown rice and other veggies. Other Vital Nutrients: Vitamin A, Vitamin C, Folate, Calcium, Magnesium, Phosphorus, Potassium, Beta Carotene, Iron, and Omega-3 and Omega-6 Fatty Acids. 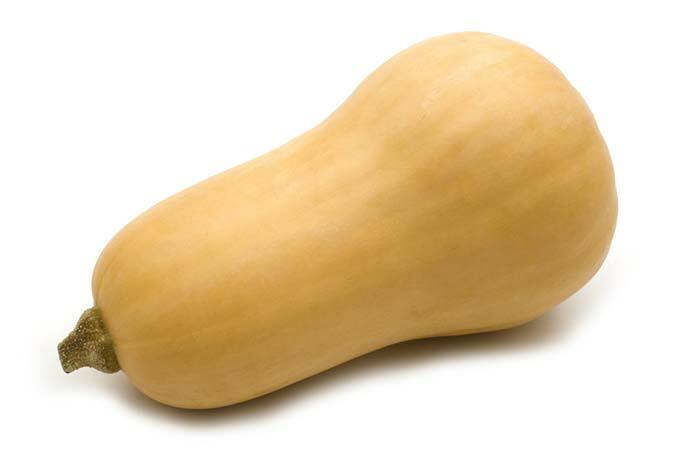 Winter squash is rich in good carbs and dietary fiber. It is also a great source of the amino acid tryptophan that helps induce sleep by reducing stress. Make a wholesome soup or add grilled winter squash to your salad. Or have mashed squash with a good portion of grilled chicken and other veggies. Other Vital Nutrients: Vitamin A, Vitamin C, Vitamin K, Folate, Calcium, Magnesium, Phosphorus, and Potassium. This leafy green vegetable not only adds flavor and color to your food but also benefits your health. You can have it sautéed with garlic cloves and a little pinch of salt or add it to your soup, salad, stew, wraps, open sandwiches, etc. 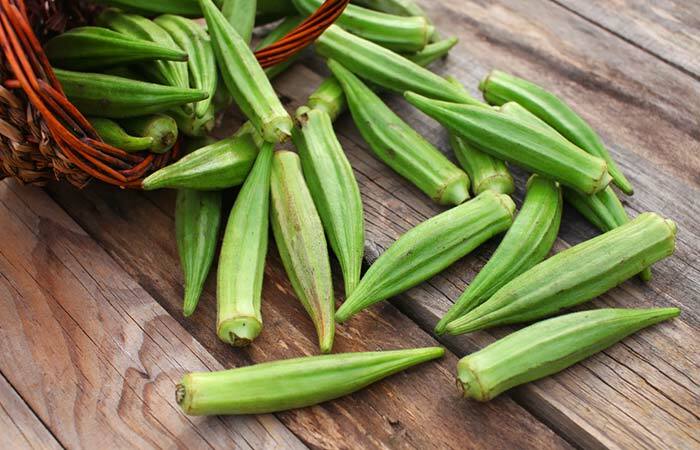 Okra is delicious and nutritious if you cook it the right way. Wash the okra and pat it dry before chopping it. Do not overcook. Have it with brown rice, pita bread or flatbread. Or simply add grilled or boiled okra to your rice bowl or salad. Other Vital Nutrients: Vitamin A, Vitamin C, Vitamin K, Vitamin E, Folate, Potassium, Copper, and Calcium. 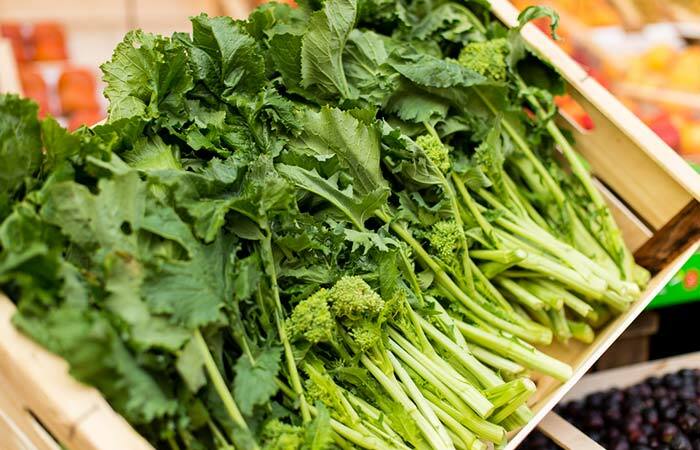 This dark green leafy vegetable is low in calories, has high water content, and is loaded with nutrients. You can add it to chicken broth, vegetable stew, tuna salads or wraps or have it blanched or steamed. Other Vital Nutrients: Vitamin A, Vitamin C, Vitamin K, Folate, Magnesium, Phosphorus, Potassium, Sodium, and Calcium. 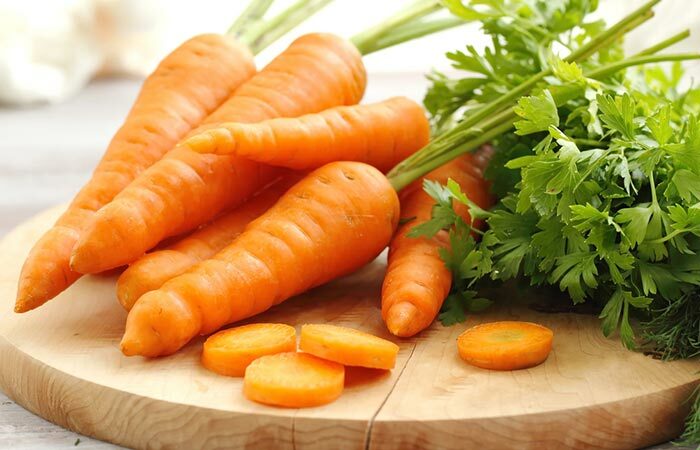 Carrots are good for your eyes as they are rich in vitamin A. They are also rich in dietary fiber, which is why you should consume them at least thrice a week. You can add raw carrots to your salad or vegetable/chicken stew. Other Vital Nutrients: Vitamin A, Vitamin K, Folate, Potassium, and Calcium. Cooked curly endive is also known as chicory and is a great source of vitamins, minerals, and dietary fiber. You can grill and toss it with other veggies and fish/chicken. You may have it as finger food or chop it and add it to omelet or wraps/sandwiches. Other Vital Nutrients: Vitamin A, Vitamin C, Vitamin K, Folate, Protein, Sodium, Magnesium, Phosphorus, Potassium, Calcium, and Omega-3 Fatty Acids. Turnip greens belong to the cruciferous plant family and are rich in dietary fiber, vitamins, minerals, and other essential nutrients. They have anti-inflammatory properties that help fight certain types of cancer. Add turnip greens to chicken or pork broth, stew or salad. Other Vital Nutrients: Vitamin A, Vitamin C, Vitamin K, Folate, Magnesium, Sodium, Phosphorus, Potassium, Calcium, and Water. Beet greens are the top leafy part of beetroots and are a great source of nutrients. These fiber-dense vegetables are easy to cook and delicious. You can sauté them with garlic cloves and have with brown rice, other veggies, and a good portion of lean protein. Beet greens also taste great in stews and soups. Other Vital Nutrients: Vitamin K, Folate, Thiamine, Choline, Polyunsaturated Fatty Acids, Monounsaturated Fatty Acids, Magnesium, Sodium, Phosphorus, Potassium, Calcium, Iron, and Protein. Flax seeds are rich in dietary fiber and healthy fats. 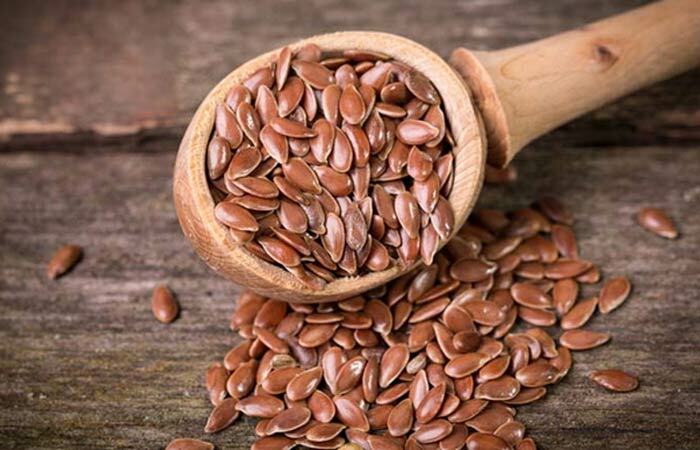 A cup of flax seeds contains about 13 grams of soluble fiber and 12 grams of insoluble fiber. Hence, it bulks up your stools, increases your satiety levels, and makes you eat less. You can grind flax seeds at home to retain the nutrients and add it to your smoothie, oatmeal, salad, or a glass of fat-free milk. Other Vital Nutrients: Vitamin K, Folate, Choline, Betaine, Pantothenic Acid, Polyunsaturated Fatty Acids, Monounsaturated Fatty Acids, Magnesium, Sodium, Phosphorus, Potassium, Zinc, Calcium, Iron, and Protein. Oat bran is another high-fiber food known for its weight loss properties. It contains 14 grams of fiber, out of which soluble fiber is 6.8 grams. Have two tablespoons of oat bran for breakfast or lunch for favorable results in just a few weeks. You can also add fruits to your oat bran bowl. Other Vital Nutrients: Niacin, Thiamin, Riboflavin, Polyunsaturated Fatty Acids, Monounsaturated Fatty Acids, Sodium, Phosphorus, Potassium, Calcium, Iron, and Protein. This humble grain is rich in dietary fiber. One cup of sorghum contains 26.50 grams of fiber. It is for this reason that sorghum is called “the new quinoa.” You can add it to your brunch veggie salad or have a light yet filling sorghum risotto for dinner. Other Vital Nutrients: Niacin, Folate, Vitamin E, Vitamin B6, Magnesium, Manganese, Sodium, Phosphorus, Potassium, Calcium, Zinc, Iron, and Protein. This is a nutritious and gluten-free grain found in brightly flowered perennial plants. 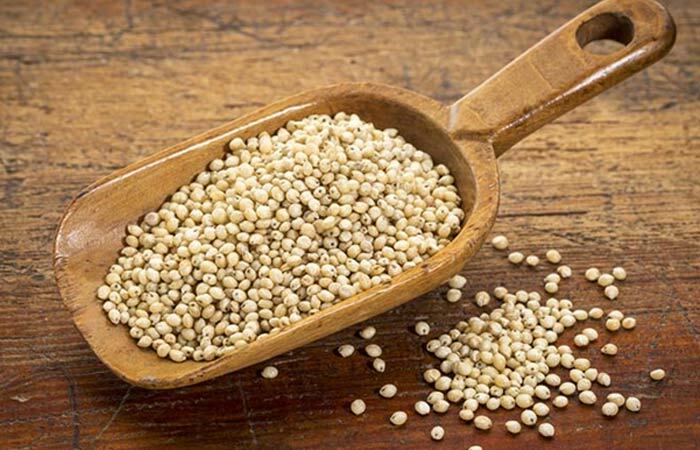 A cup of amaranth contains about 29.60 grams of fiber. It is also a rich source of calcium, phosphorus, manganese, and iron. You can add it to sautéed veggies for lunch or dinner. You can even grind it to make gluten-free flour or prepare porridge for breakfast. You could also use amaranth to bake muffins, cookies, and other sweet treats. Other Vital Nutrients: Vitamin A, Vitamin K, Niacin, Folate, Choline, Vitamin B6, Magnesium, Manganese, Sodium, Phosphorus, Potassium, Calcium, Zinc, Iron, and Protein. This is another high-fiber grain. 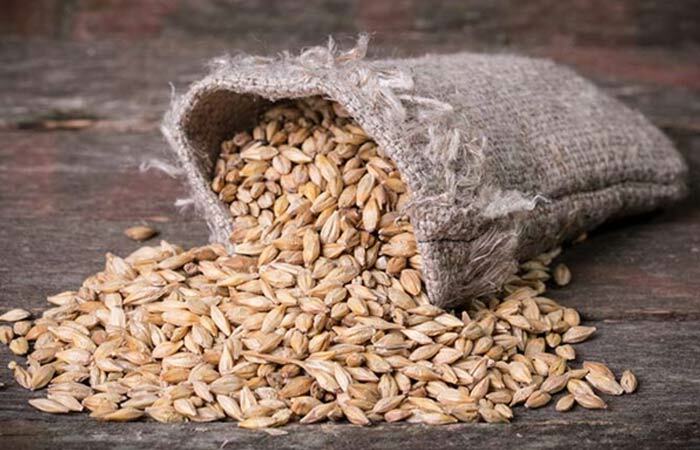 A cup of barley contains about 31.20 grams of fiber. It is also an excellent source of potassium, magnesium, vitamin B6, and iron. You can make barley porridge. Or add barley to oats or chicken or turkey stew. Other Vital Nutrients: Vitamin A, Folate, Magnesium, Manganese, Sodium, Phosphorus, Potassium, Calcium, Zinc, Iron, and Protein. Pumpkin seeds taste sweet and nutty and are a great source of soluble and insoluble fiber. A cup of pumpkin seeds contains 2.40 grams of soluble fiber and 6.4 grams of insoluble fiber. They are also a rich source of healthy fats, vitamin A, calcium, potassium, and magnesium. You can add them to your breakfast smoothies or porridge. Or add toasted pumpkin seeds to salad or casseroles. Other Vital Nutrients: Vitamin A, VItamin C, Vitamin K, Folate, Niacin, Magnesium, Manganese, Sodium, Phosphorus, Potassium, Calcium, Zinc, Iron, and Protein. This delicious nut is a high-fiber food. 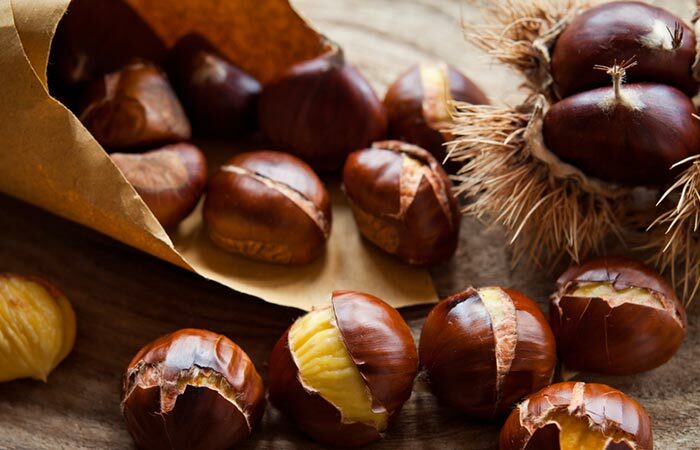 A cup of chestnuts contains 16 grams of fiber. It is a rich source of vitamin C, folate, calcium, zinc, phosphorus, and monounsaturated fatty acids. You can have a handful of chestnuts as a snack or add them to your meat for dinner. You can give your low-fat frozen yogurt an extra crunch by topping it with crushed chestnuts. Other Vital Nutrients: Polyunsaturated Fatty Acids, Monounsaturated Fatty Acids, Vitamin A, VItamin E, Folate, Niacin, Magnesium, Manganese, Sodium, Phosphorus, Potassium, Calcium, Zinc, Iron, and Protein. Almonds are also a great source of dietary fiber and healthy fats. Soak 4-5 almonds in water overnight and have them in the morning with breakfast. You can also add almonds to desserts, salads, pilaf, and curries. Other Vital Nutrients: Polyunsaturated Fatty Acids, Monounsaturated Fatty Acids, Vitamin A, Thiamin, Riboflavin, Folate, Niacin, Magnesium, Manganese, Sodium, Phosphorus, Potassium, Calcium, Zinc, Iron, and Protein. 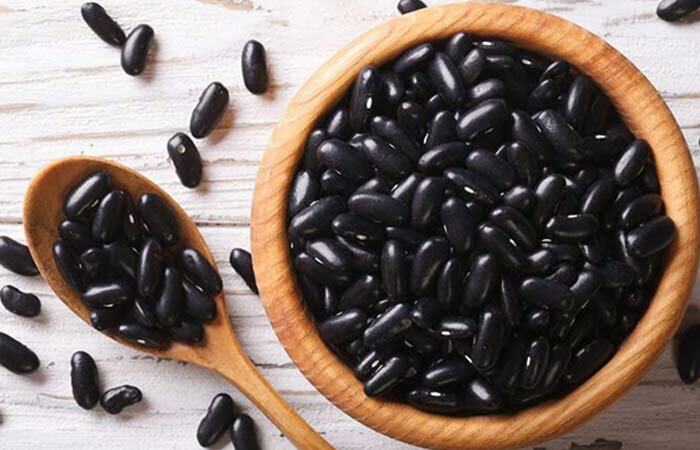 Black beans are a great source of dietary fiber and protein. A cup of black beans contains 12.2 grams of fiber. You can include them in your diet by soaking them overnight and boiling them the next day. Have them for lunch by adding some fresh veggies, cilantro, and a dash of lime. You can also cook them chili-style and have it for dinner. Other Vital Nutrients: Vitamin K, Thiamin, Riboflavin, Folate, Niacin, Magnesium, Manganese, Sodium, Phosphorus, Potassium, Calcium, Zinc, Iron, and Protein. A cup of lima beans contains 7 grams of soluble fiber and 6.20 grams of insoluble fiber. They are also rich in vitamins, minerals, proteins, and other phytonutrients. You can add lima beans to your quinoa (for breakfast), chicken salad (for lunch) or grilled salmon (for dinner). Other Vital Nutrients: Vitamin A, Vitamin K, Vitamin C, Thiamin, Riboflavin, Folate, Niacin, Magnesium, Manganese, Sodium, Phosphorus, Potassium, Calcium, Zinc, Iron, and Protein. One cup of lentils contains about 15.6 grams of fiber. 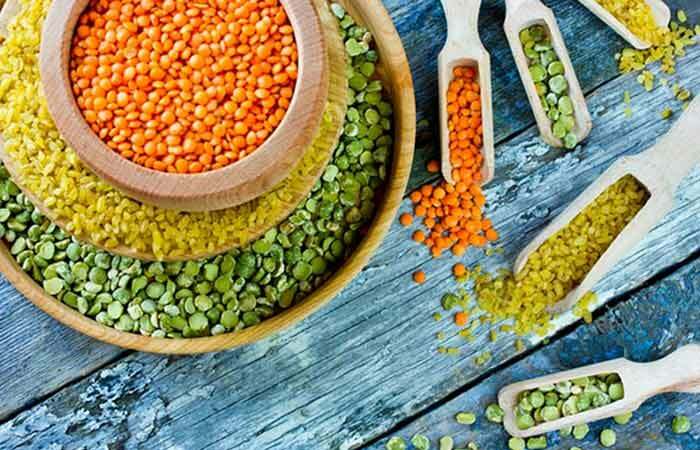 Lentils are also a good source of protein and minerals like manganese, thiamin, potassium, and iron. You can include them in your diet by boiling and adding them to salads or having lentil soup with or without veggies for dinner. These 31 fiber-rich foods will help you reach your target weight and improve digestion and bowel movement. I have also designed a fiber-rich diet chart for you to make the most of the foods mentioned above. You can try your own version of the diet chart, but make sure to include high fiber foods for weight loss and strike a balance between soluble and insoluble fiber. Here’s the diet plan for you. (7:00 – 7:30 a.m.) 1 cup of warm water with the juice of a lime. (8:00 – 8:45 a.m.) Oatmeal with chestnuts and peaches. Spinach and sapodilla smoothie with 2 tablespoons of oat bran or eggs, avocado, and a glass of low-fat milk. Mid-Morning Snack (10:30 a.m.) A glass of fresh prune juice or a handful of pistachios. (12:30 – 1:00 p.m.) Sautéed veggies with amaranth. Black bean lettuce wrap with avocado and veggies. (4:00 p.m.) Green tea and 1 oats and barley cookie. A glass of raspberry and guava juice with a teaspoon of ground flax seeds. (7:00 p.m.) Grilled chicken with veggies topped with pumpkin seeds. Lentil and green peas or lima beans soup. For dessert, you can have low-fat frozen yogurt with chopped peach. So, you see, you can follow this high-fiber diet for weight loss without trying too hard. But if you want to lose weight, you should also follow a simple, easy-to-follow exercise routine. Just take out 20 minutes to do these simple exercises mentioned below. Following this exercise and nutrition plan will help bring a change in your lifestyle gradually. Changing your lifestyle is very important when it comes to losing weight. Including high-fiber and nutritious foods in your diet, avoiding junk and processed foods, working out regularly, and getting proper rest are essential for weight loss. Let me tell you how dietary fiber is useful and about soluble and insoluble fiber. Soluble Or Insoluble Fiber – Which One Is Ideal For Weight Loss? Fiber is of two types – soluble and insoluble, depending on the property to dissolve in liquids. When soluble fiber comes in contact with water, it is converted into a viscous material and slows down food absorption in the large intestine. This makes you feel full for a long duration. Insoluble fiber helps to trap the fat molecules and acts as a stool bulking agent and prevents the absorption of fats. It is more helpful for those suffering from constipation as it increases bulk and promotes bowel movement. 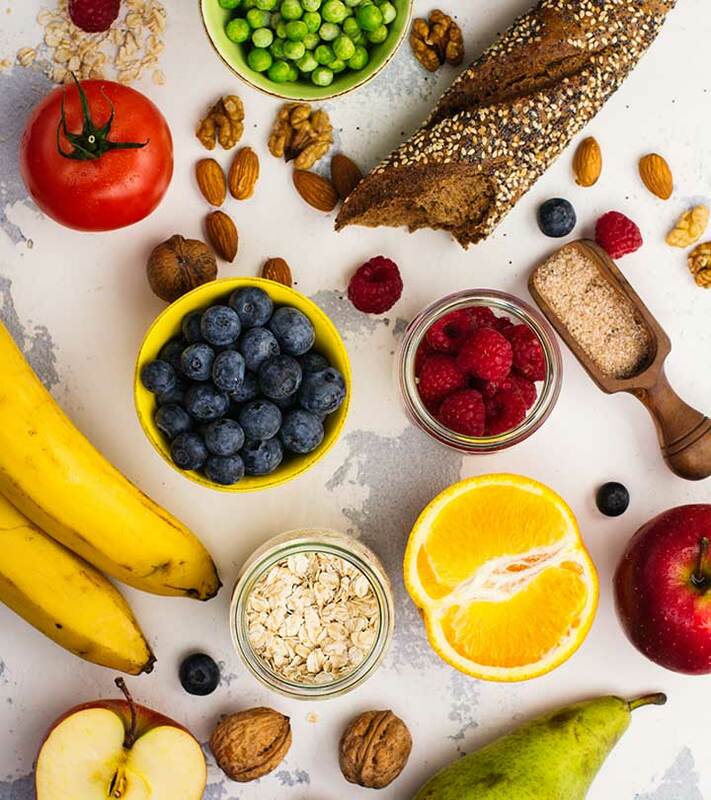 Therefore, it is clear that if you want to lose weight, you should look at food sources that are rich in soluble fiber along with a good amount of insoluble fiber. Now, let’s find out how fiber aids weight loss. 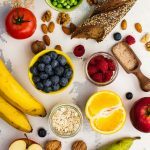 Fiber and weight loss – what is the connection? Fiber aids weight loss by boosting satiety and increasing the number and varieties of good gut bacteria in the intestine (2), (3). You must have heard that good gut bacteria help in digestion and promote overall health. They help in digesting the soluble fiber with the help of a specific bacterial enzyme. So, basically, soluble fiber acts as food for the gut bacteria, and the bacteria help to digest it and produce short-chain fatty acids (4), (5). These short-chain fatty acids reduce belly fat by increasing fat metabolism (6). Also, this whole interaction of soluble fiber with gut bacteria increases the variety and number of gut bacteria. The presence of different types of good gut bacteria is linked to the reduced risk of type II diabetes and heart disease and decreased levels of bad cholesterol. But does this mean you can have unlimited amounts of fiber? Let’s find out in the next section. Fiber For Weight Loss – How Much To Consume? The recommended daily fiber consumption for women below 50 years of age is 25 g and above 50 years of age is 21 g.
Though high-fiber foods are great for weight loss, they should be avoided if you are suffering from IBS, diverticulitis, ulcerative colitis, or Crohn’s disease. If you have shown any symptoms of stomach irritability recently, talk to your doctor before deciding to start this diet for weight loss. You can lose weight rapidly by eating fiber-rich foods and also maintain the weight by choosing a healthy lifestyle. So go ahead and achieve your weight loss goals in no time! Take care. Are Cinnamon And Honey Effective For Weight Loss? 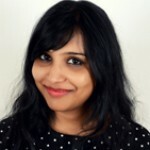 Losing Weight With Food Was Never This Easy!